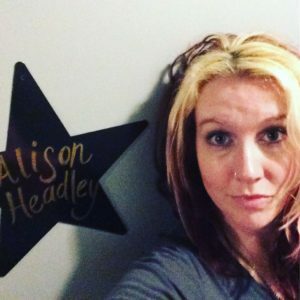 Alison Headley grew up in Texas, and lived in Houston and Austin before making her way to St. Louis. She’s spent her career as a web and graphic designer and front-end developer, but she’s also worked professionally in writing, editing, photography, social media, blogging, sewing, and jewelry production and design. Alison found trapeze in her late thirties and discovered a love of exercise, performance and act creation she never knew she had. “Trapeze was hard and painful. But it spoke to my inner weirdo who felt like an awkward loner, marginalized by conventional team sports, and I kept coming back. 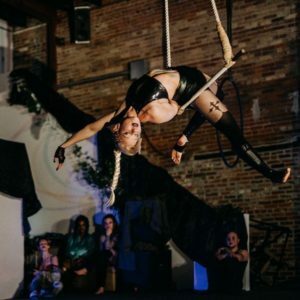 I want anyone who has felt like they could never be an athlete, anyone who has ever felt body shamed or that they weren’t fit for sport, to know that they’re welcome in the aerial community and that THEY CAN DO THIS.” At Bumbershoot Aerial Arts in St. Louis, Alison produced and performed in 3 successful aerial student showcases. She has received aerial teacher training from Born to Fly™ Aerial Teacher Training and is working on her ACE personal trainer certification. Claire Hilleren is from St. Louis and received her BFA in Dance with a ballet emphasis from Webster University in December 2008. Webster University is where Claire caught the aerial bug through working with Monica Newsom on Aerial Silks. 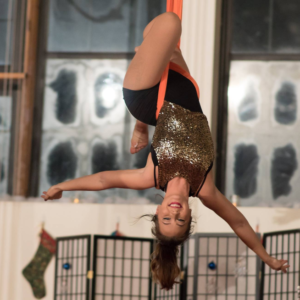 After graduation Claire continued her aerial training at Bumbershoot Aerial Arts, doing ambient and choreographed gigs in St. Louis. Claire has attended both the Aerial Dance Festival and the American Dance Festival to further her dance and aerial vocabulary. Taking classes from dancers/choreographers; David Dorfman, Ohad Naharin, Mark Haim, Abby Yager, Ishmael Houston-Jones, David Brick, and Yvonne Meiers and aerialists; Kevin O’Connor, Danielle Hendricks, Alex Allen, and Susan Murphy. Claire joined the Modern American Dance Company in the Fall of 2009 and continued until June 2018. 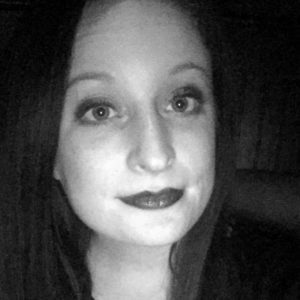 Claire has gotten the chance to choreograph on MADCO, MADCO 2, University of Missouri St. Louis Dance Department, ambient and choreographed aerial gigs, El Monstero Winter and Touring Performances, and Music Videos. I was first introduced to aerial arts on single point trapeze about 10 years ago in Athens, GA. I studied at Canopy Studio in Athens, GA until November 2014, when I moved to St. Louis. 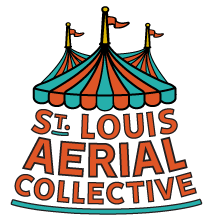 After moving to St. Louis, I began taking classes at Bumbershoot Aerial Arts. At Bumbershoot I have been able to explore static trapeze and rope and expand my aerial vocabulary. I have always enjoyed teaching and took the Bumbershoot teacher training in summer 2015, then took a Nimble Arts teacher introductory teacher training in 2017. I have been lead teaching beginning level silks and slings since 2017. I have also taught 2 introduction to dance trapeze workshops. Dance trapeze remains my favorite apparatus. The thing I love most about it is that it behaves like a mixture of static trapeze and silks. Sandra Manzoni is an aerialist based in St. Louis, Missouri. In 2006 she was first introduced to circus arts by a high school friend in Paris, France and found that she was an enthusiastic but terrible juggler. Then she met a Trapeze and fell in love. She’s been taking classes, teaching, and performing aerial arts ever since. 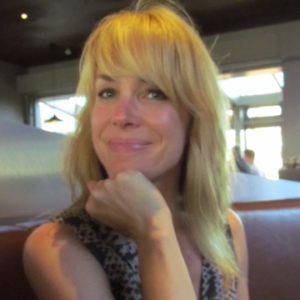 Sandra has both taught and taken classes from Circus Day Foundation and from Bumbershoot Aerial Arts. 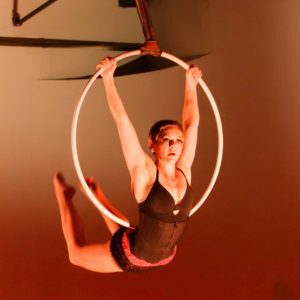 She has taken classes and workshops through NECCA, Frequent Flyers, Aircat Aerial Arts, the Circus Center of San Francisco, ALOFT Circus Arts, Circus Flora performers and from ENC graduates. Having performed both as a freelance aerialist, and as a traveling member of the Beggars Carnivale, her specialties include Static Trapeze, Single Pointe Trapeze, Aerial Silks, Corde Lisse, Aerial Hoop, Stilt Walking, and Silent Comedy. She collects rubber ducks and marbles. Plz consider inviting her to be in your DnD campaign. Lisa Natoli is a freelance aerial artist specializing in silks, rope, and lyra. She attended the Alvin Ailey certificate program before receiving her degree in dance at the University of Iowa. She trained as an aerialist in NYC with Laura Witwer, Kevin O’Connor, and Terry Beeman. As an aerialist Lisa has performed in private, corporate, and staged events across the nation including Jenny Rocha’s “The Dinner Party: A Whodunnit Cabaret” and “Migrations”, choreographed by Cirque Du Soleil-alum Kristin Young. Lisa has performed at Black Hearts Burlesque (Minneapolis),Burlesque Below The Bridges (Brooklyn) and has performed in the Floating Kabarette at Galapagos Art Space (Brooklyn), The Slipper Room (NYC), and Lannie’s Clocktower Cabaret (Denver) . Lisa has been presenting her own evening length and ensemble work as well as curates evenings as Lisa’s Bright Ideas and Bright Ideas Aerial Salon in Brooklyn, NYC since 2008. LBI has collaborated with pedal steel player Bob Hoffnar, German photographer Henryk Spiess, and playwright Carrie Louis Nutt. Lisa has taught on-going classes at Aloft (Chicago), Circus Warehouse (NYC), Aerial Arts (NYC), The Muse (Brooklyn), and House of Yes (Brooklyn), and Frequent Flyers (Boulder). She has also taught many workshops across the nation: Aircat Aerial Arts (Boulder), Aerial Acrobatic Arts (Denver), Miraas Circus Arts (Denver), Bumbershoot (St. Louis), Project in Motion (Las Cruces), Altitude Aerials (Phoenix), Vertical Arts (Phoenix), Tucson Circus Arts (Tucson), Agora (Detroit), Detroit Flyhouse (Detroit), Contemporary Circus Arts Festival of Toronto (Toronto). April Silverman grew up curious and independent, two qualities that have permeated her life ever since. After college she wandered across the world. Her first business was creating a laundry contracting service for workers building EuroDisney outside of Paris in 1990, and since then she has worked managing employees at construction companies in the office and as an on site foreman. Currently she owns and operates Home Girl Masonry. 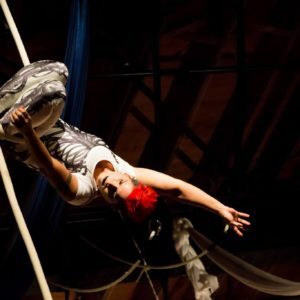 Always looking to innovate and find new outlets for her creative energy, April paired her love of circus with her building experience to become the head rigger for Bumbershoot Aerial Arts, where she also worked as a coach, sharing her love of circus. “Aerial Arts feed all parts of my soul, from the physical and mental challenges of doing the art, to the joy of creating and storytelling with circus bodies in my choreography, to the satisfaction of imparting my passion to others,” she says. Along her journey she has been a ringmaster, a public speaker, a youth coach, and a monthly circus show producer. She is hands on in all her endeavors, and you are likely to find her in the air, at work and at play. Coty discovered her love for aerial in the summer of 2010 at Bumbershoot Aerial Arts. She was hooked from the first class. Aerial arts gives you a confidence like nothing else. It is the best workout you’ll ever get and it empowers you to do anything you put your mind (and body) to; like a superman drop from 20 feet in the air! Her students and fellow instructors continue to inspire her to become a better aerialist and instructor. She has trained in silks, rope, hoop, trapeze and slings. Although she has a strong background of trapeze, slings quickly became her main aerial focus. She believes it combines the best of all the apparatuses and anything is possible on a sling. Merrily found aerial after seeing Pink’s 2010 Grammy performance of Glitter In The Air. She started taking silks classes and quickly learned that being upside down is the best thing in the whole world! A comprehensively certified Pilates instructor by day, she loves the strength, confidence, and movement that aerial provides and also how it forces her out of her comfort zone on a regular basis. But most importantly, it’s a lot of fun! She has added aerial yoga/Pilates to her repertoire and is really excited about teaching it to kids and adults of all ages. She also stays up to date on the latest research on fascia and its role in movement and attends as many workshops and lectures on the subject as possible. A mother of five, including two bonus kids, she spends her off time trying to keep up with her rambunctious little people. 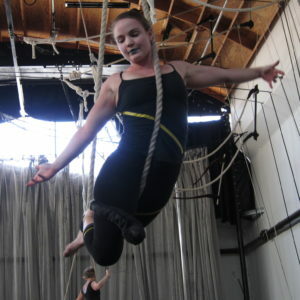 Bumbershoot Aerial Arts Beginner/Level 1 teacher training fabric/trapeze. Level 1 Aerial Yoga certification at Aircat Aerial Yoga Boulder Circus Center, Boulder, Co.
Nimble Arts beginner fabric teacher training.